The Aldgate skyscrapers seen from top of The Shard. Being at the top of The Shard building was a part of my 29th birthday surprise prepared by my fiancee. 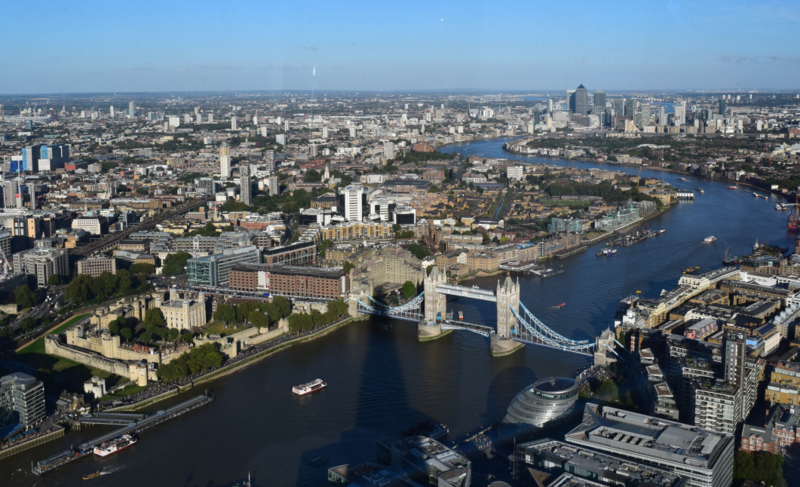 We went that day to London for one-day trip to visit a few less visited spots and round off our day on The Shard building on the evening. My fiancee’s plan stated, that we will stay on the top until sunset and next back to Cambridge from Liverpool Street station. The Shard has been finished in 2009. Actually this is the highest building in Europe with 309.6m height. The Shard is one of the most prominent skyscrapers in London. Learn more here. Pic. 1 The Shard seen from St. Thomas street. Being close is hard to cover whole building from bottom to the top. We came to The Shard just before 5pm. That day in London was quite nervous, because of my broken phone, that made a difficult o navigate our route properly. We had admission at 5pm. We couldn’t enter to the building when late. 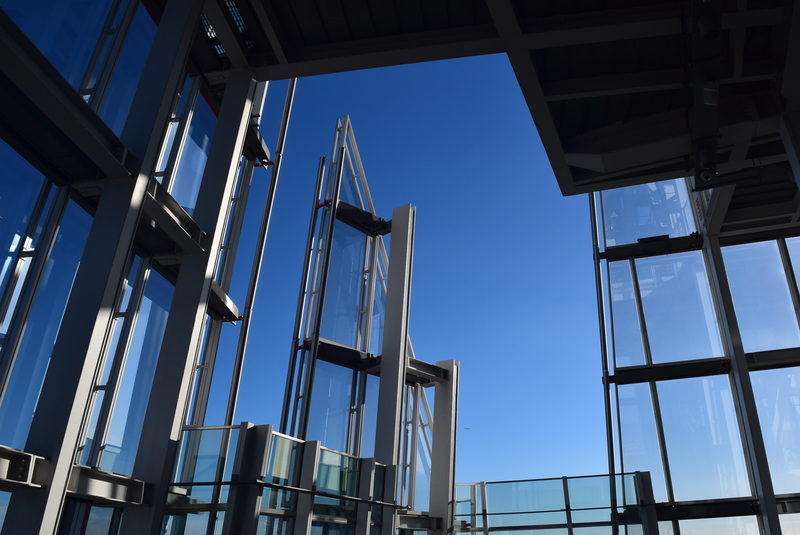 The highest floor on The Shard, accessible for visitors is 72th. It allowes you to reach slightly more than 270 m.a.g.l height. Still remains nearly 40 m to the very top of the building. Using the lift you can get into 70 floor and go upstairs for next 2 floors. There is the bar and another facilities on the very top. Pic. 2 The 70th floor of The Shard. Pic. 3 The interior the top of The Shard. View from 72th on 70th floor, where the virtual tour guide facilities are located. Pic. 4 Upper parts of the Shard are open. There are a few upper floors I think, but visitors are not allowed to go there. Visiting The Shard was the best part of that trip. I very like panoramic views from high located places like mountain top or skyscrapers. 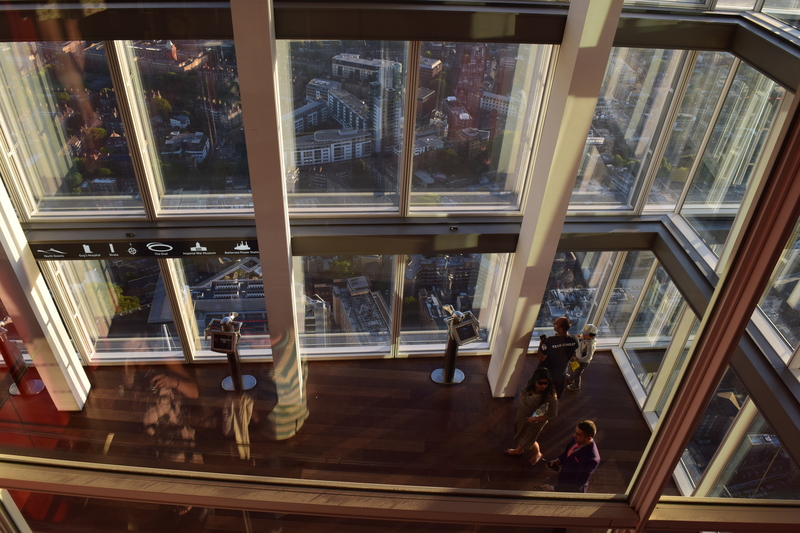 It was one of the best experience to see remote places from the top of The Shard. I saw e.g Stokenchurch BT Tower, Southend at Sea and Stansted Airport. To identificate some another places I used the heywhatsthat website, where I have generated the panorama according to my position. Pic. 5 Possible far up view from the Shard (close-up) (heywhatsthat.com). Pic. 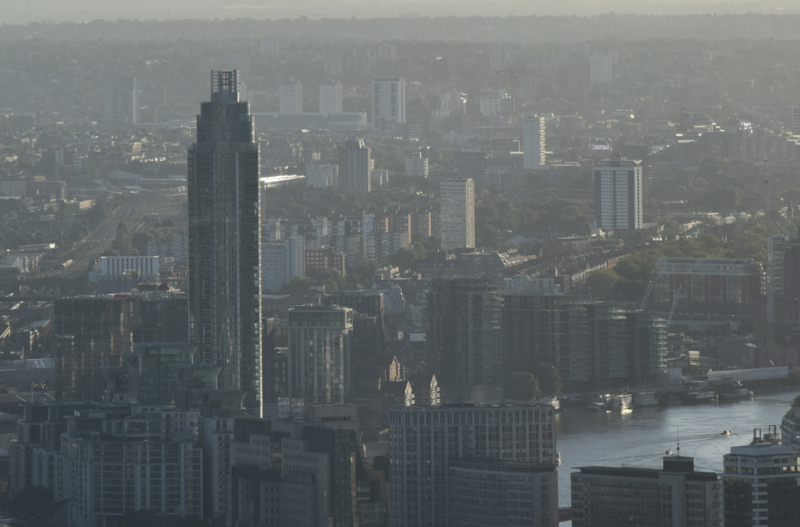 6 The far up view from The Shard with places captured on 11th September 2016, during my staying (heywhatsthat.com). 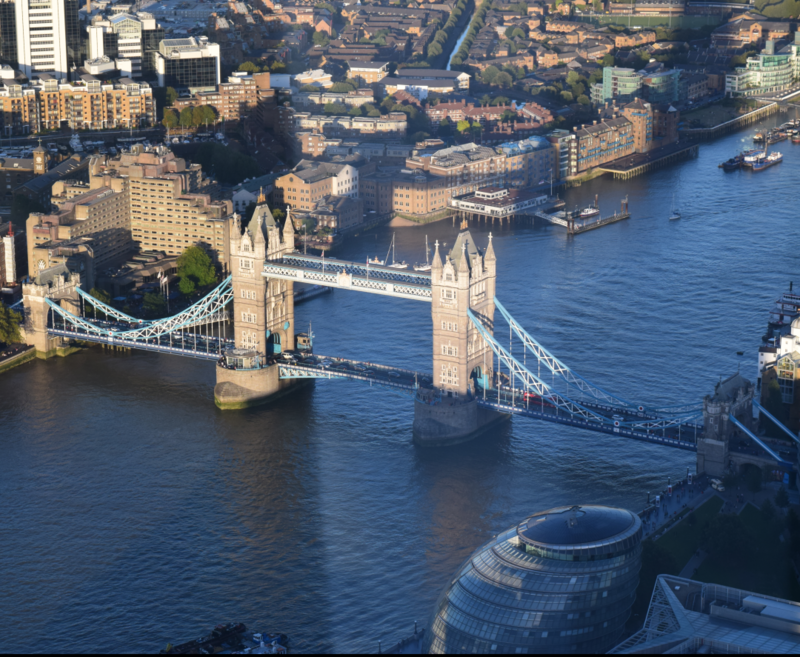 The Shard is a very high building, however it rises above London basin, which is around 150m-250m deep against surrounding area from the north and south. 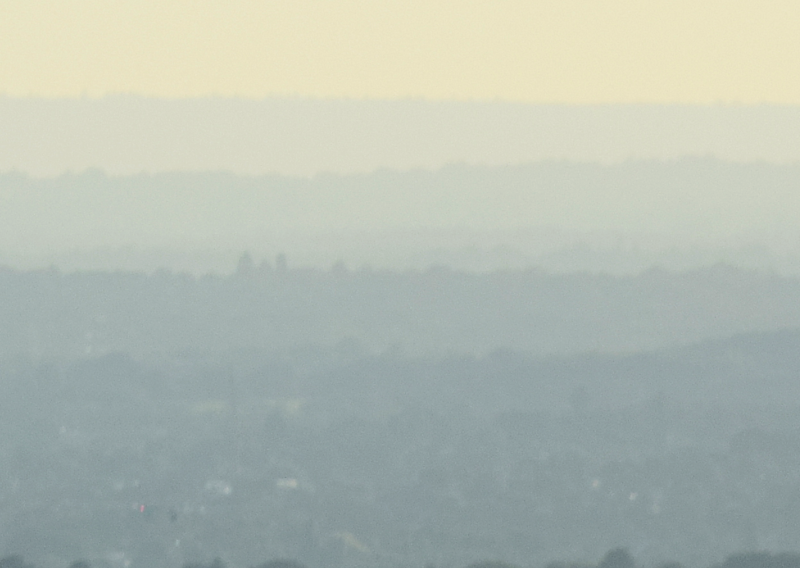 The north-west horizon is determined by Chiltern Hills, that stretches from more or less from Reading area through the south Oxfordshire (Stokenchurch) to Bucks & Herts with the highest wale-looking Coombe Hill, that rises above Wendover. 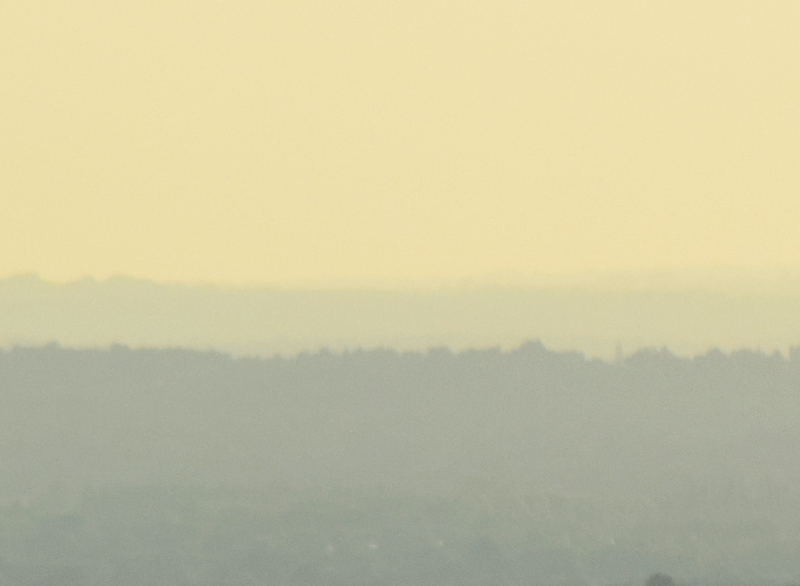 One prominent object, which can be seen (under fair weather codnidions) beyond the Chiltern Hills is the Didcot powerplant chimney as high as 250m.a.g.l. 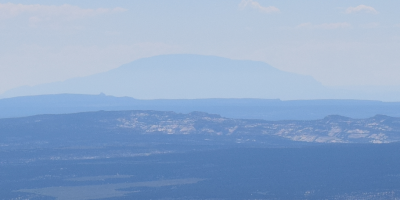 in a 80 km distance (Pic. 7). Pic. 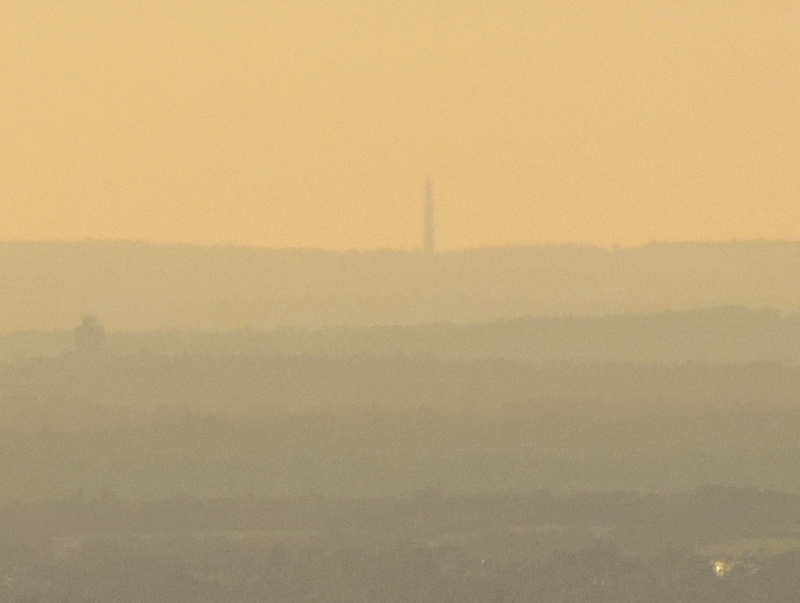 7 Didcot powerplant chimner (on the left) at 80km distance and Stokenchurch BT Tower (on the right) at 60km distance, seen from the top of The Shard. Click to enlarge. Pic. 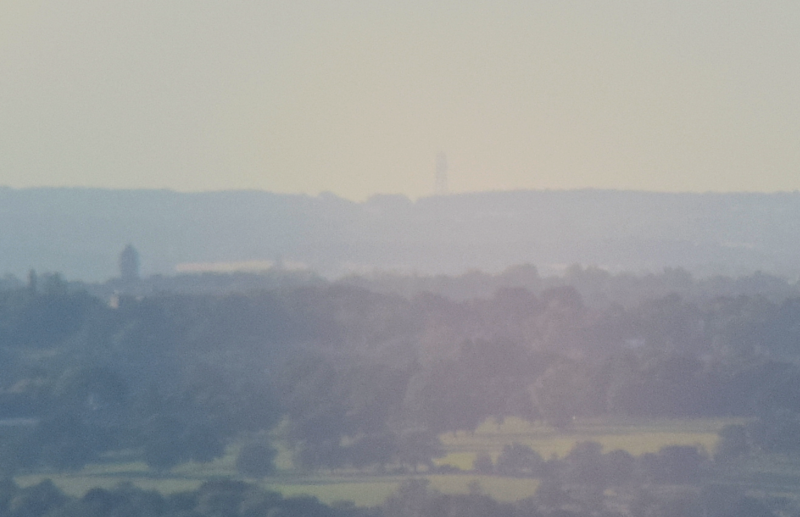 8 The Stokenchurch BT Tower seen from The Shard (distance 60 km). See an original image here. Pic. 9 View towards the highest part of Chiltern Hills, that encloses the north-west horizon. The highest Coombe Hill (262m.a.s.l.) beyond (distance 54 km). See an original image here. From the north you can see also that hills, that encloses the horizon far beyond, however there are not officially called. Chiltern Hills terminates on the Dunstable Downs. Towards north you can see multitude of hills partially free of forest. The most remarkable place, covered from the Shard by myself is Stansted Airport. Pic. 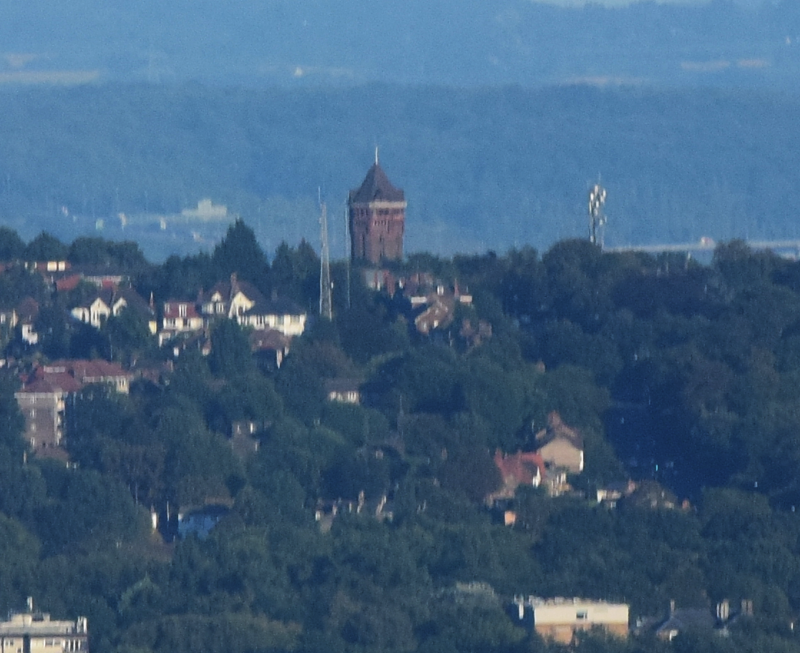 10 View on Therfield Heath with telecomms transmitter towering above Royston (distance 57 km). Picture cropped, See an original image here. Pic. 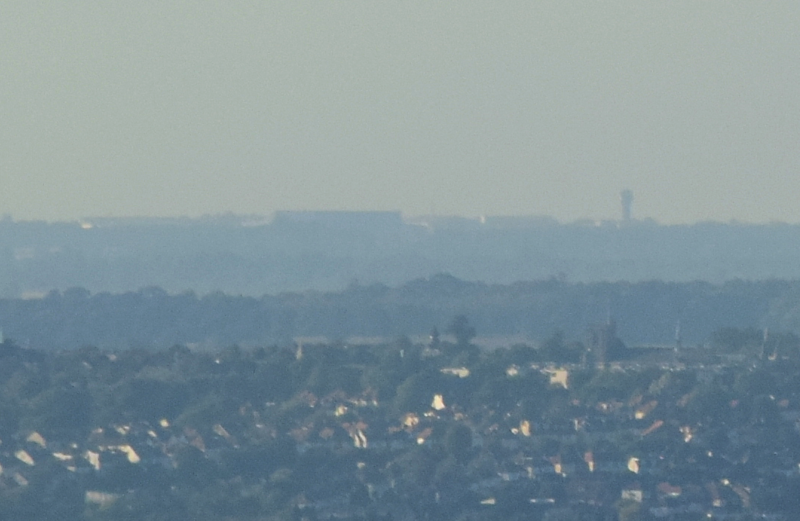 11 The Stansted Airport seen from The Shard (distance 49 km). Picture cropped. See an original image here. I am not well with Suffolk area, although I could see some hills far away, that I can classify to the Suffolk region. In my opinion the most interesting part of the horizon is east, where everyone can spot the Thames Estuary with North Sea beyond. 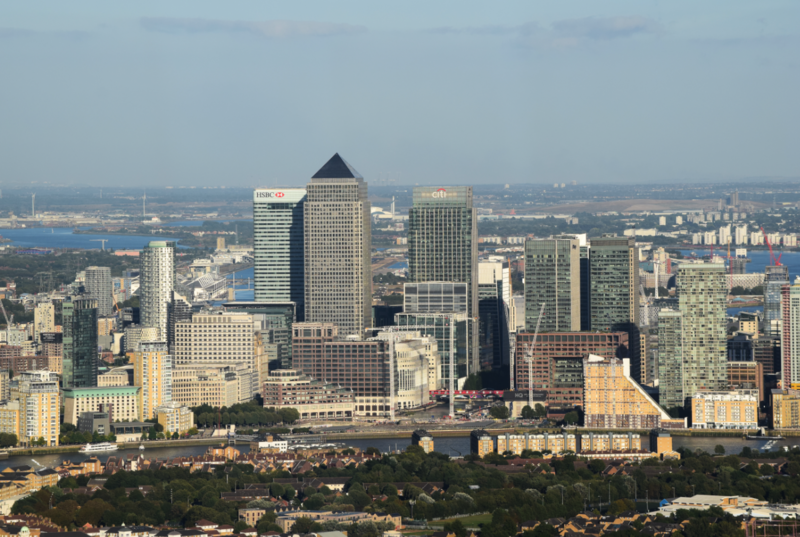 This area is to be seen Just right of the Canary Wharf skyscrapers. On the left the Southend bank is to be seen. This is the same place, that I have visited 2 weeks earlier. 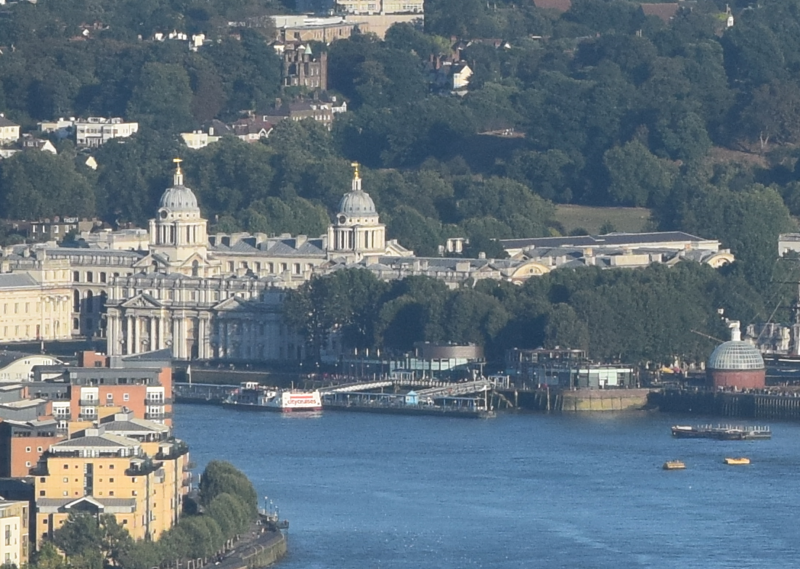 There is the longest pier in the World, that was hard to cover by myself from top of the Shard. Pic. 12 The Southend-on-Sea bank, where the longest pier in the World is located (distance 57 km). Picture cropped. See an original image here. Pic. 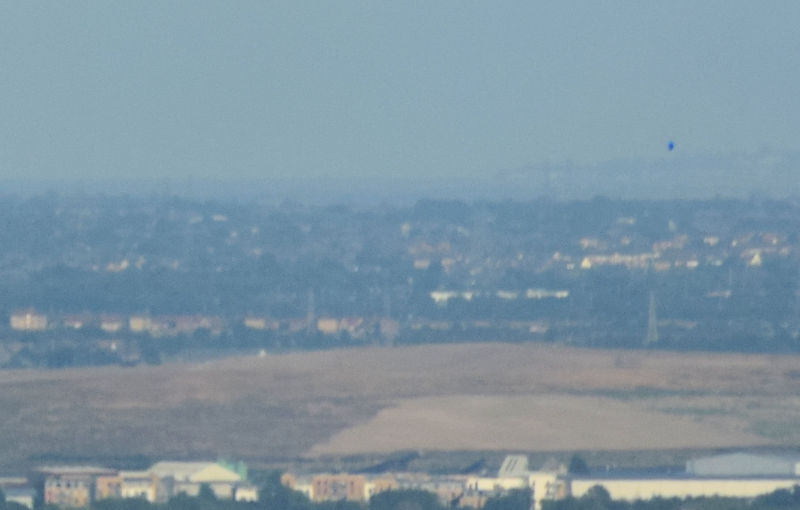 13 Thames Estuary seen from The Shard (distance 50-60 km). Picture cropped. See an original image here. Pic. 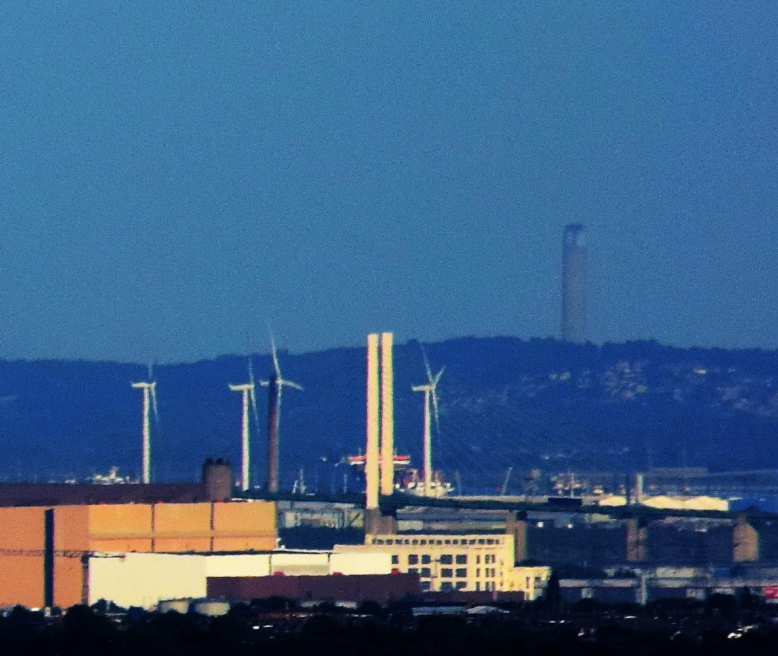 14 The Grain Power Station – the tallest construction in Kent (244m)(57 km distance). Click to enlarge. Pic. 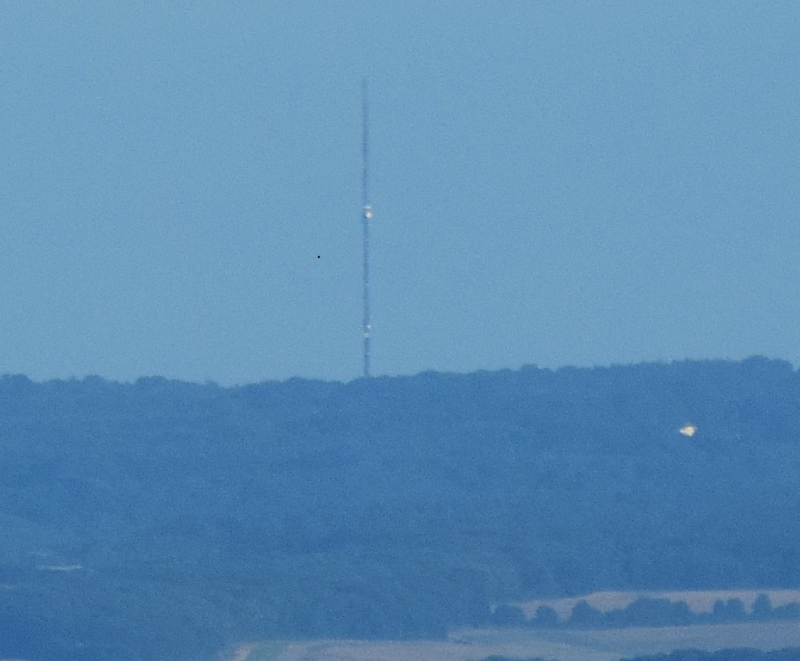 15 Dover Transmitter mast barely visible (distance 97 km), 130mm. Pic. 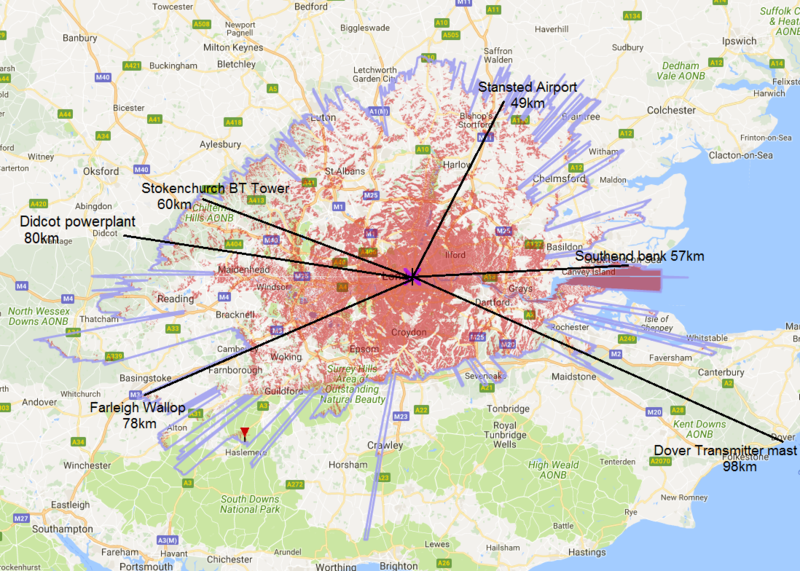 16 Wrotham Transmitter mast (distance 37 km). See an original image here. South east part of the horizon is occupied by North Downs hills. There are twin highlands with South Downs, protected by national park. The highlands, that consist South Downs National Park are to be seen on the south horizon. Pic. 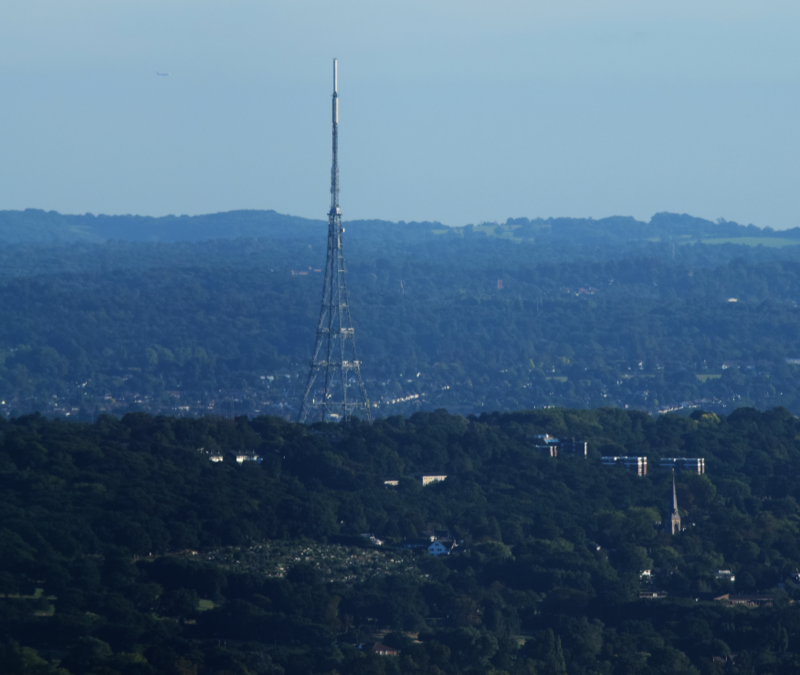 17 The Crystal Palace Transmitter towering above south London (distance 10 km). See an original image here. Pic. 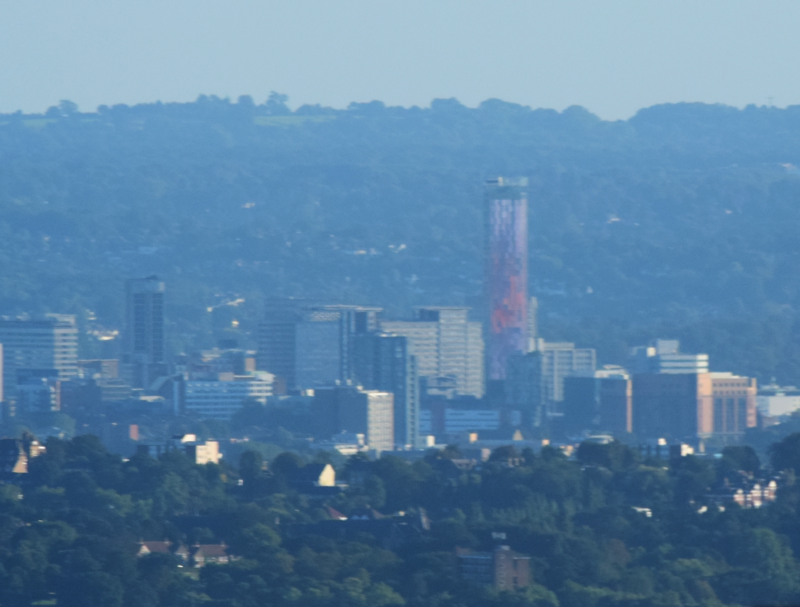 18 The Croydon city centre panorama with towering Saffron Square (colorful tower)(distance 15 km). See an original image here. Pic. 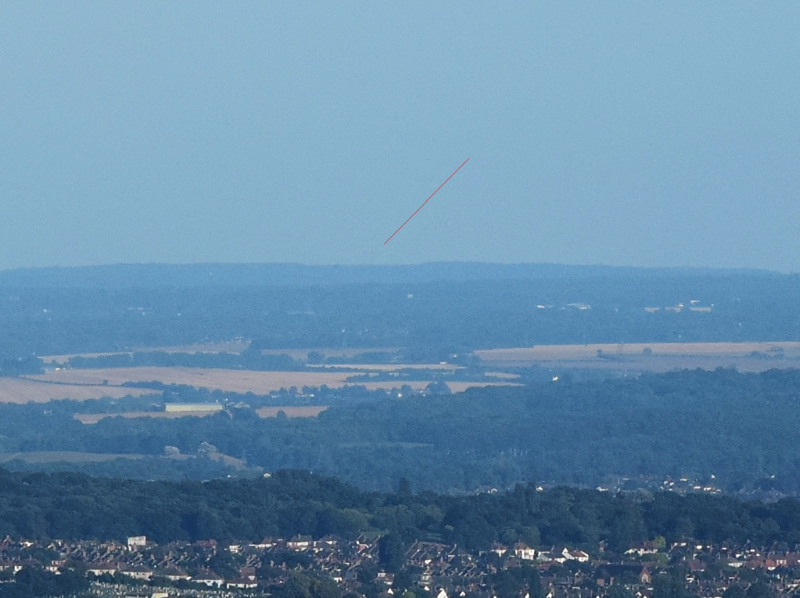 19 Remote South Downs region seen from The Shard (distance 60-80 km). See an original image here. Pic. 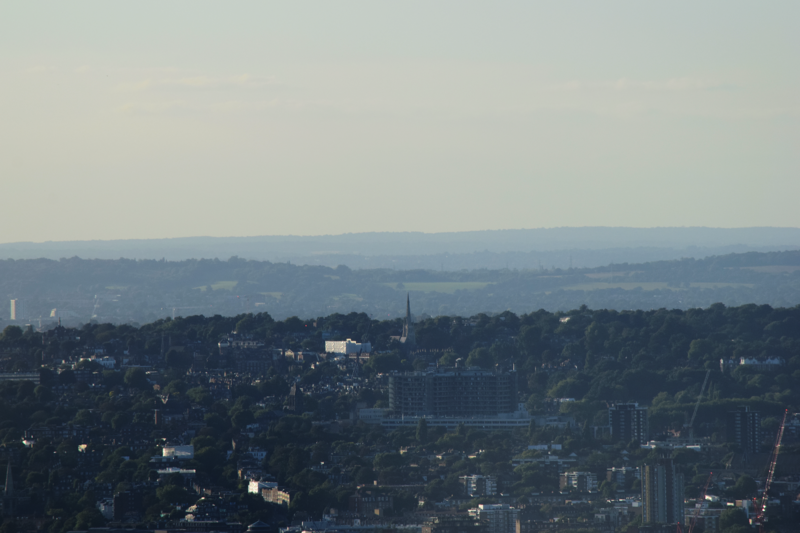 20 Western part of the South Downs seen from the Shard (distance 80 km). Pic. 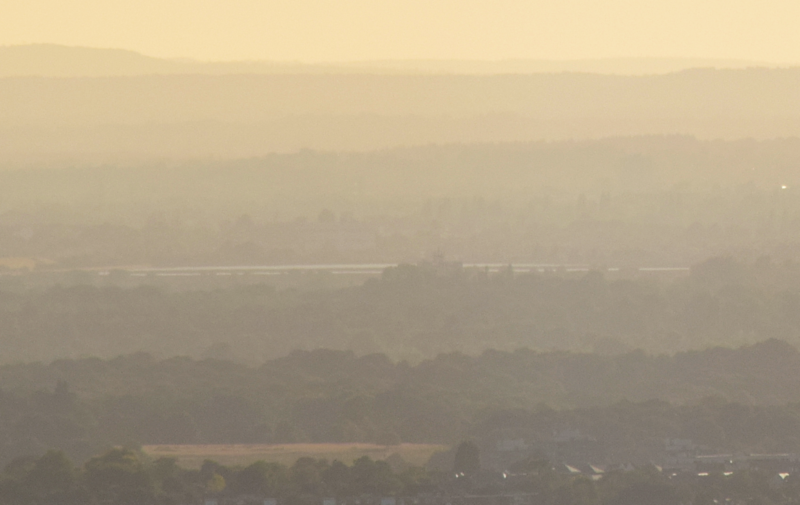 21 View on the Richmond Park and remote Farleigh Wallop hill near Basingtoke (distance 78 km). See an original image here. Most of those pictures has been captured with Nikkor 300mm lenses. I can admit, that the conditions were very favourable that day. It fred me to enjoy the furthest views, that are possible to make from the top of the highest skyscraper in Europe. 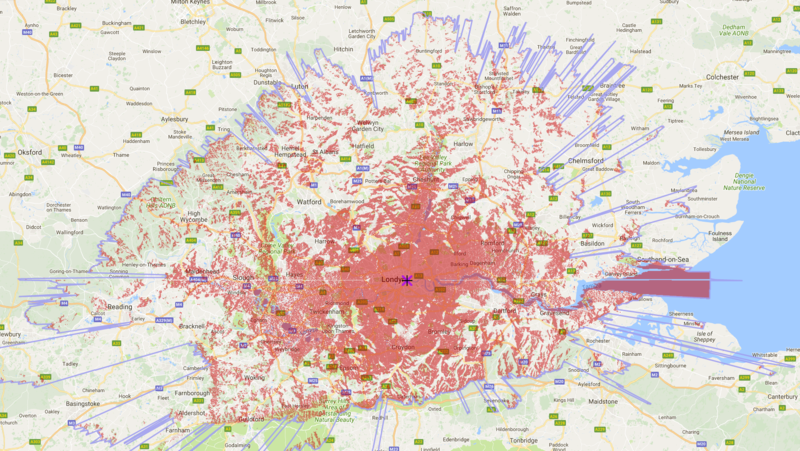 Now take a look for closer objects, that are situated in London. See the photos below, and try to recognize those places on your own. 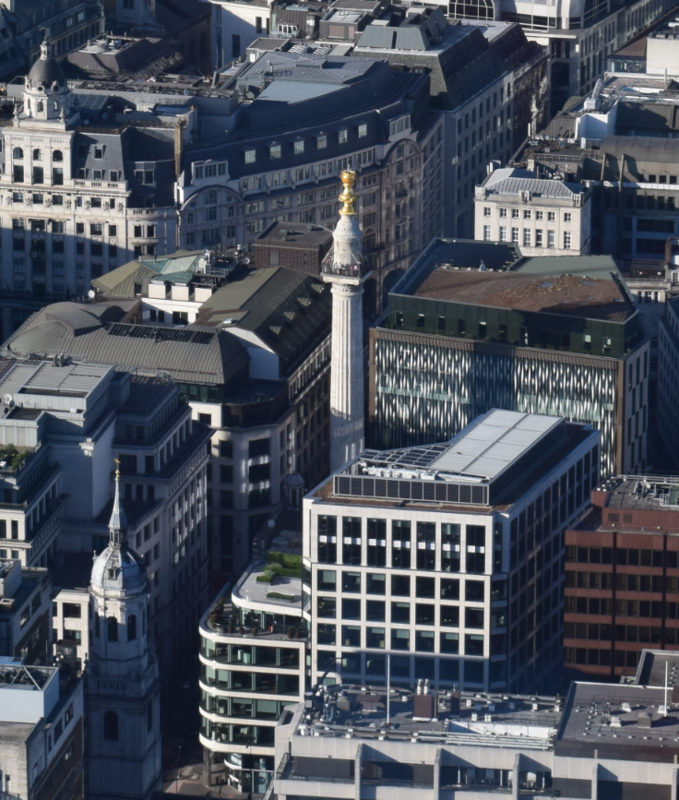 I mean many interesting spots in Greater London, that you will able to see, when you get on top of the Shard. 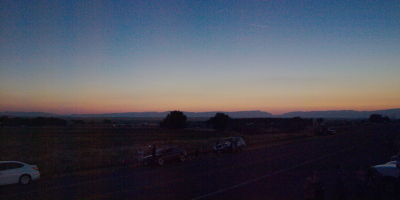 I described a few, however some wide-angle photos may show much more objects, that you would be able to see. Pic. 22 The Wembley stadium seen from The Shard. See an original image here. Pic. 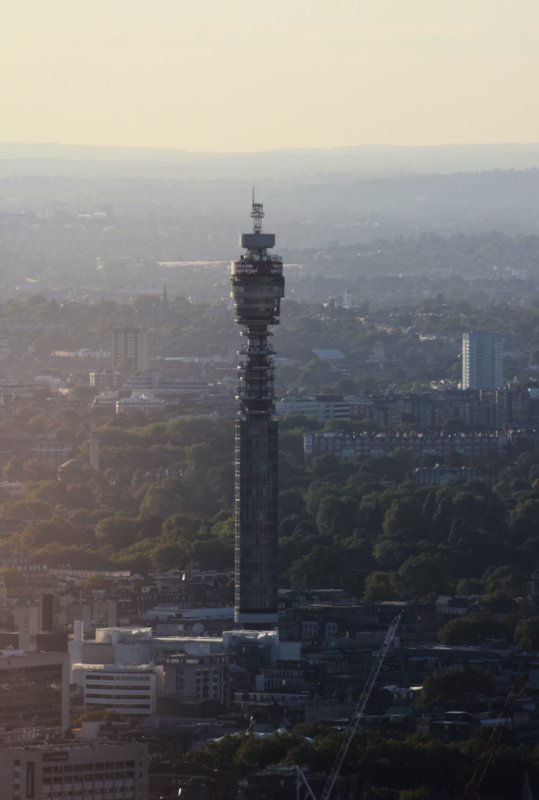 23 The BT Tower seen from The Shard. See an original image here. Pic. 24 The Canary Wharf seen from The Shard. See an original image here. Pic. 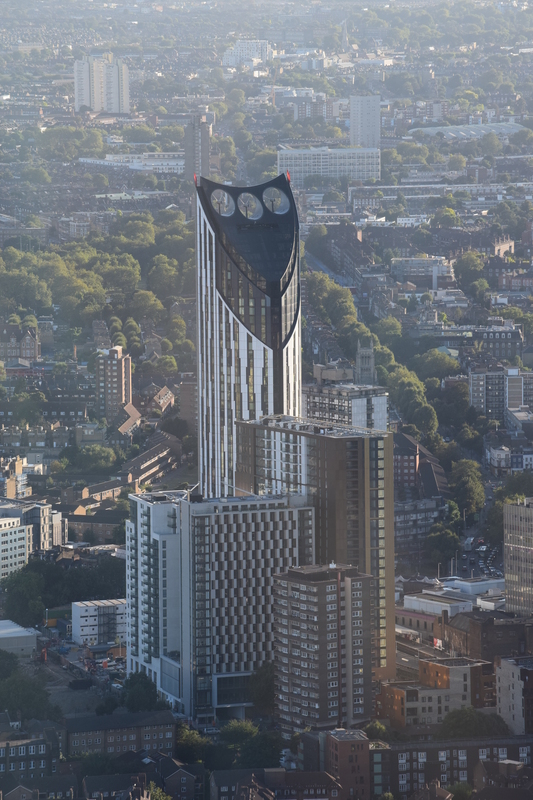 25 The Strata residential building seen from The Shard. See an original image here. Pic. 26 St. George Tower with St. George Wharf seen from The Shard. See an original image here. Pic. 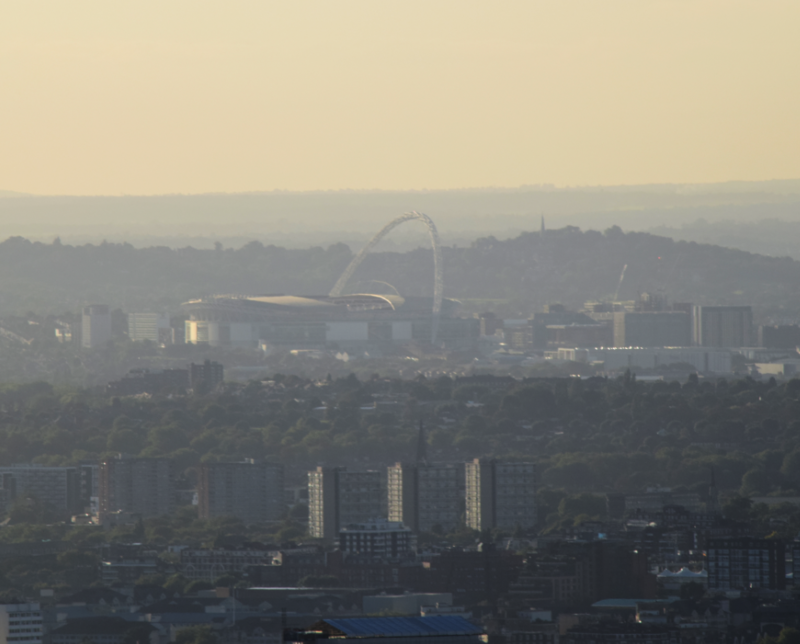 27 The Olympics Stadium with ArcelorMittal Orbit on the right, click to enlarge. Pic. 28 The Greenwich University. Pic. 29 The Shard’s shadow casting on Thames and Canary Wharf beyond. See an original image here. Pic. 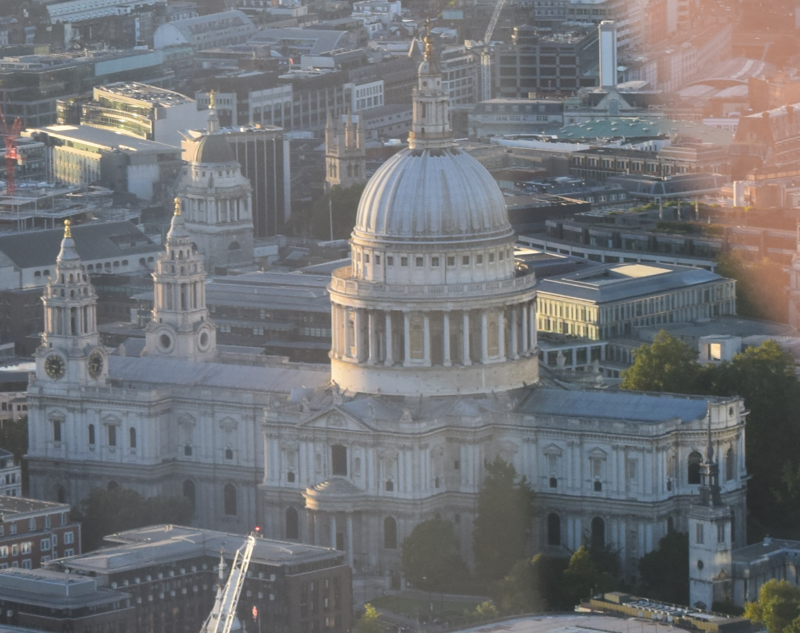 30 The St. Paul Cathedral seen from The Shard. Pic. 31 The north bank skyline seen from The Shard. See an original image here. Pic. 32 The Walkie Talkie (20 Fenchurch Street), The Gherkin (30st St. Mary’s Axe) and 122 Leadenhall Street skyscraper seen from The Shard. See an original image here. Pic. 33 The Monument seen from The Shard. Pic. 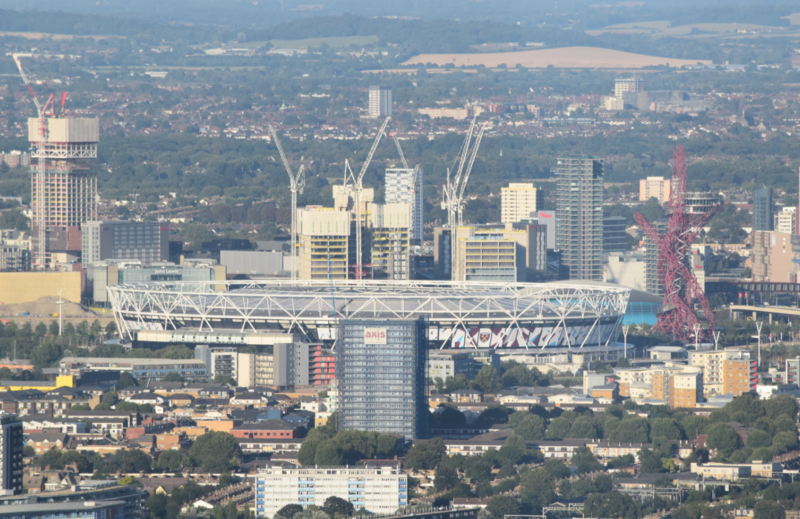 34 The Stratford panorama with Olympic Stadium. See an original image here. Pic. 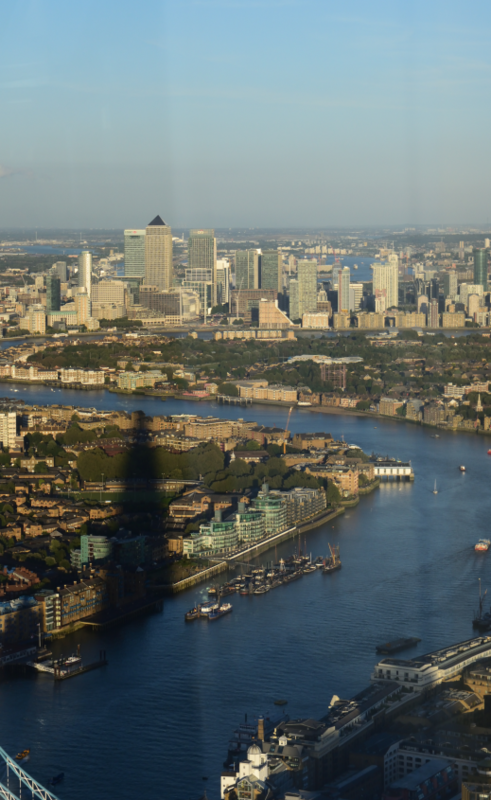 35 The Greater London panorama with Tower Bridge, City Hall and Canary Wharf beyond. See an original image here. Pic. 36 The Tower Bridge and City Hall seen from The Shard, click to enlarge. Pic. 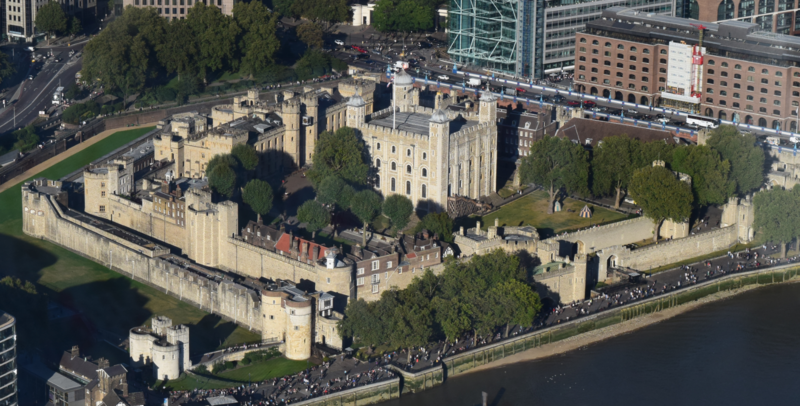 37 The London Castle seen from The Shard. Pic. 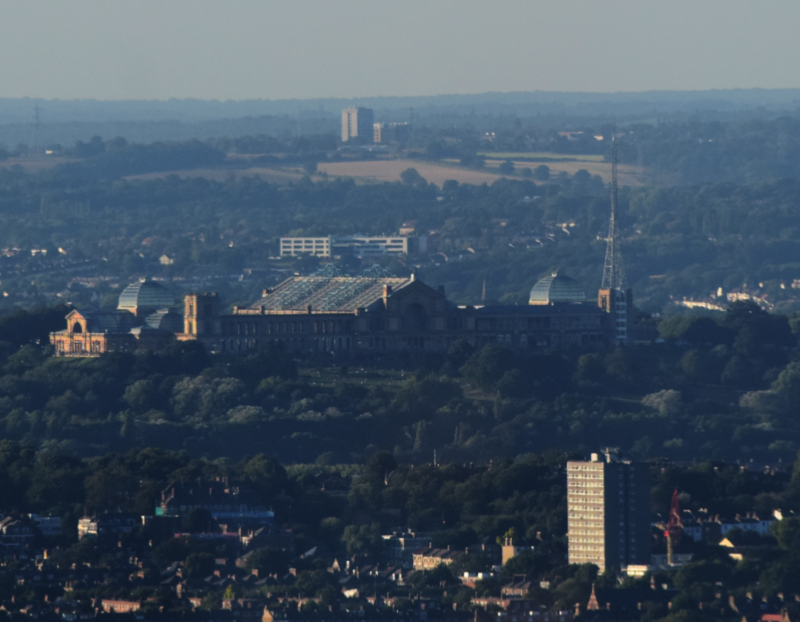 38 The Alexandra Palace seen from The Shard. See an original image here. Pic. 39 View on Shooters Hill with old water tower. See an original image here. I tried to avoid making pictures directly below the sun, because of the glass reflecting the light. 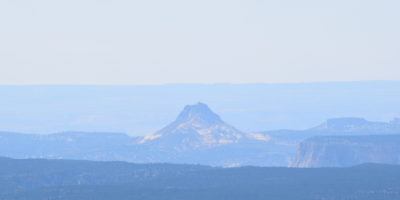 It was hard to make a clear pictures in this conditions, though I couldn’t stop due to amazing view. Pic. 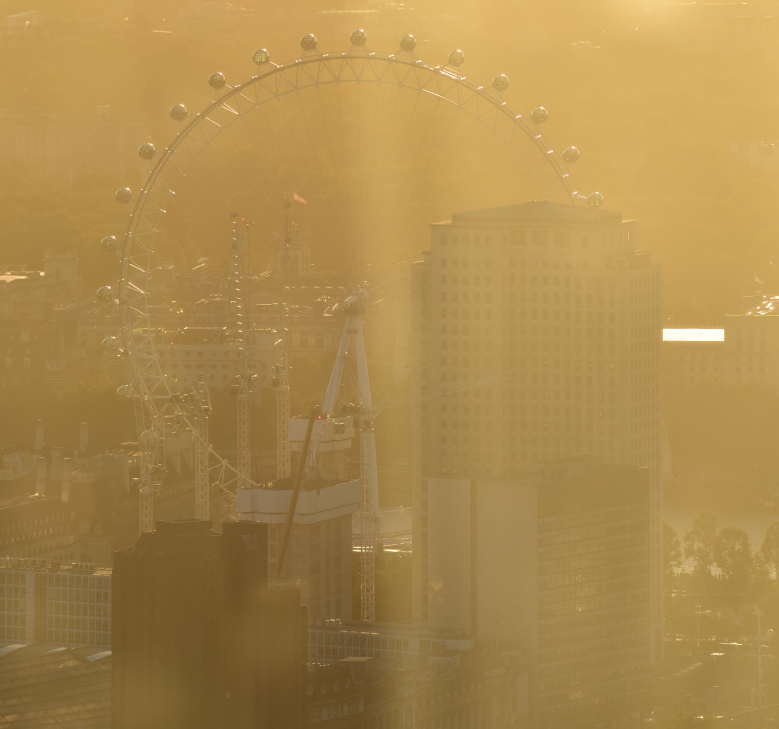 40 London Eye seen from The Shard. Unfortunately the solar rays interrupted in making a good picture. It was funny to see another visitors on the opposite side of Thames River – on the Sky Garden located at the top of Walkie Talkie (20 Fenchurch Street) skyscraper. I have been there also and apply more info soon. Pic. 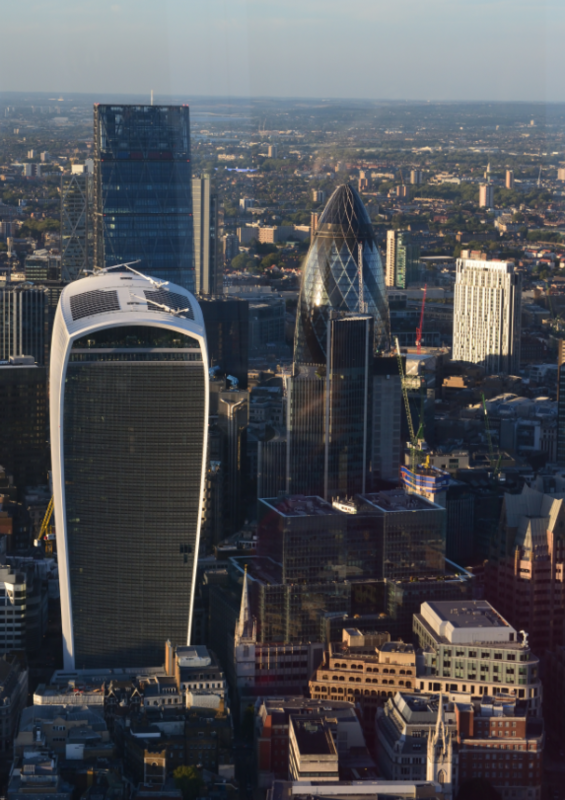 41 The Sky Garden located at the top of Walkie Talkie (20 Fenchurch Street) on the opposite side of Thames river. I can recommend everyone to visit The Shard. 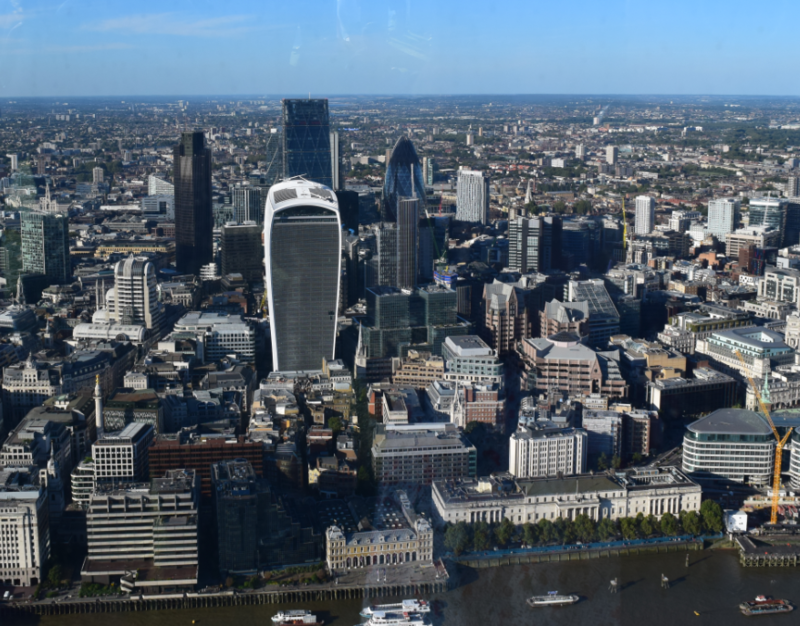 You can experience the bird-eye view of central London and see a whole Greater London literally from one place! 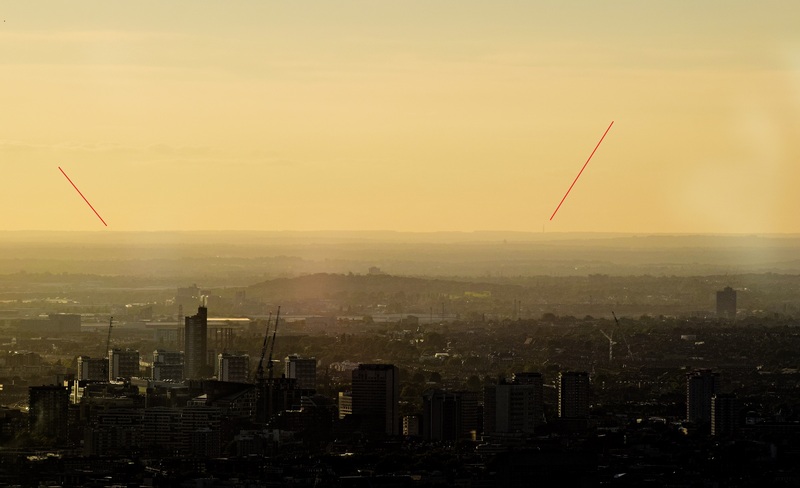 The Shard – Live view towards north-west, refresh every 5 mins. 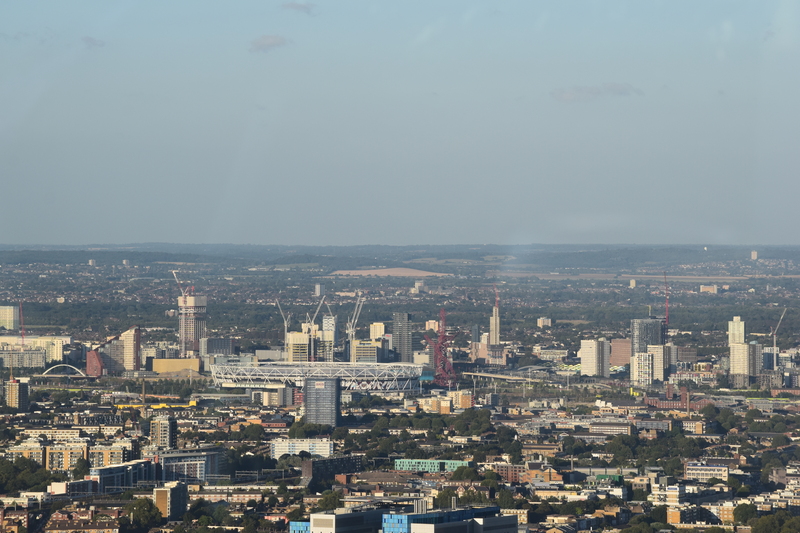 The Shard – Live view towards east, refresh every 5 mins. Great shots! 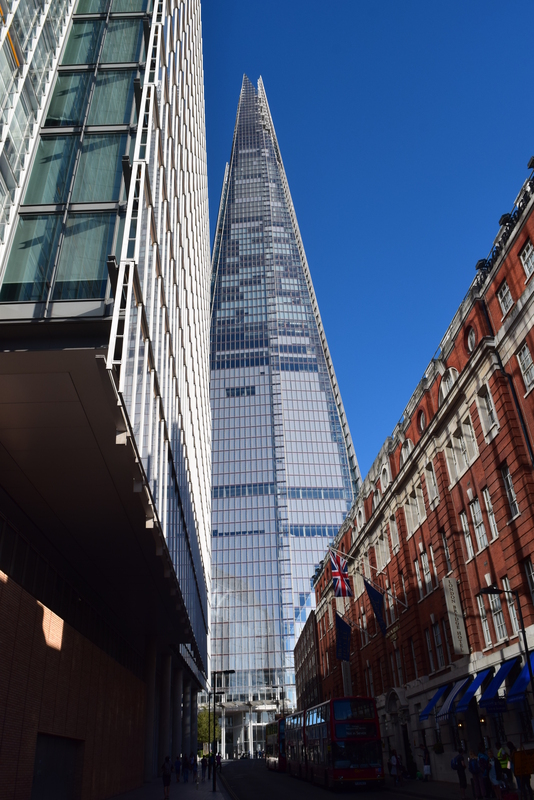 I would love to go up the Shard, I was pleased to finally see it in person a couple years back. Views seem very impressive. Fajne zdjecia. 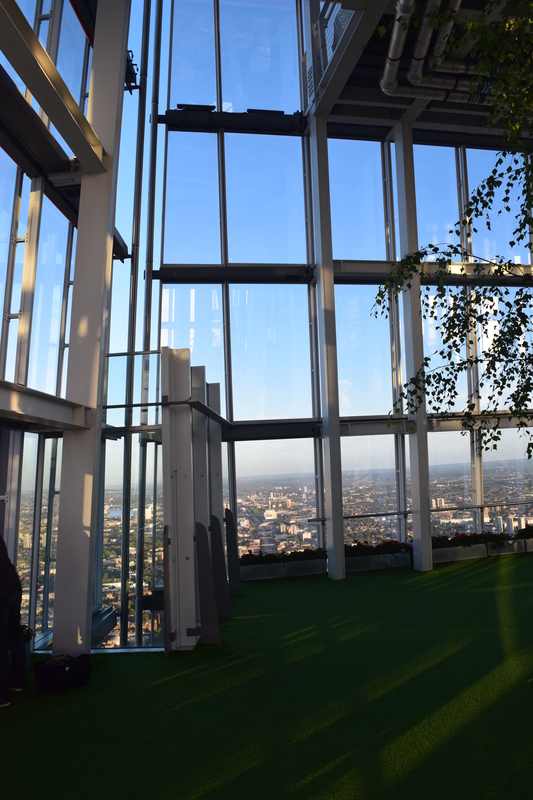 Jesli chodzi o Sky Garden, to chyba moje ulubione turystyczne miejsce w Londynie, mam nadzieje ze wstep jest wciaz darmowy? 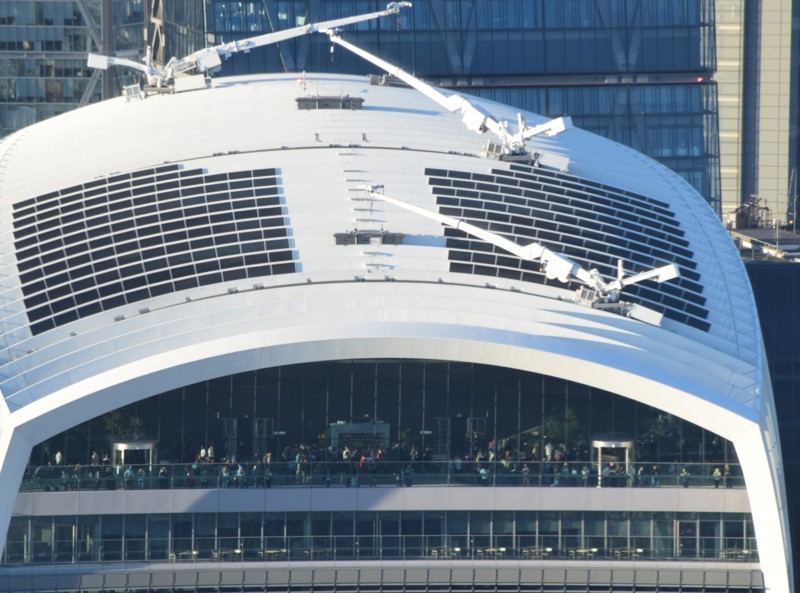 Kolejny moj artykul z tej serii jest o Sky Garden. Tam podalem tez linki do bookowania wejsciowek. Mysle ze tak, ale trzeba sprawdzac co jakis czas.